In 1993, I purchased the spectacular property upon which I built Castello di Amorosa. It sat on a hundred-seventy beautiful acres of forest and hills with a stream, a lake, one of the first houses built in Napa County and a great Victorian home where I chose to live. It was my dream property, culminating a search of many years. The purchase also came with a great building permit for a large winery building which had taken the previous owner thirteen years to obtain. At first, I had no intention of starting another winery- I already had V.Sattui. My plan was only to replant historic vineyards there. However, throughout my adult life, I had been fascinated with Italian medieval architecture; and, because of my passion- some would say obsession- I had already bought a handful of ancient properties in Italy, including a small castle near Florence (now sold), a medieval monastery near Siena (now being refurbished) and a Medici palace in southern Tuscany, which we are remodeling into a period hotel. You get the picture- it’s an incurable malady. My ideas began to crystallize. 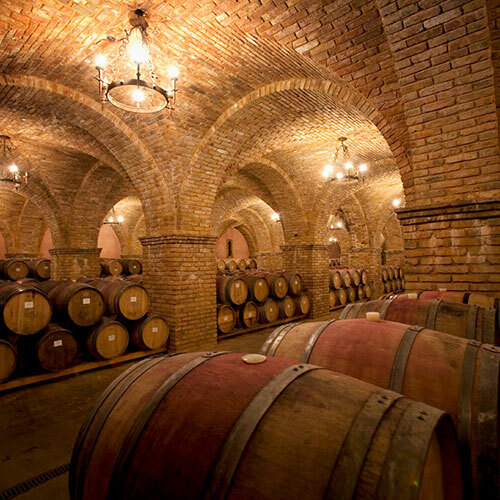 I would specialize in making small lots of primarily Italian-style wines, showcase them in an authentic, medieval castle setting and sell them directly to the public, not in stores or restaurants. Since I have never had a television, I had a lot of time on my hands. In early 1994, I embarked on my project. Concurrently with replanting thirty acres of vineyard on the property to Sangiovese, Cabernet and Merlot, I began drawing plans for the winery building. As a hobby, I had spent years visiting and studying medieval architecture, collecting thousand of detailed photos and measurements. 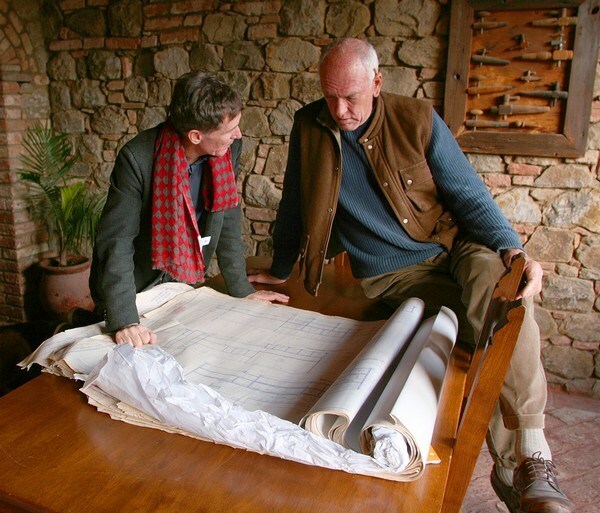 I obtained building plans of Italian castles; I even pretended to be an interested buyer, dressing in suits to get realtors to show me through castles I would have never seen otherwise. I was determined to bring a slice of Italy I loved to the Napa Valley. Tell me I can’t do something and, if it is important to me, I will try to prove you wrong. My greatest incentive to do this project came in Beaune, France, in 1984 when the idea was still germinating. 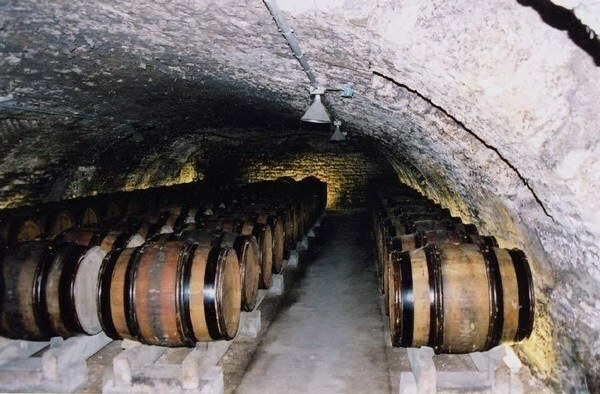 I was in Burgundy visiting the greatest wine cellar I had ever seen, that of Patriarch cellars, built over two hundred years in the 13th and 14th centuries. It contained over seven acres of underground cellars and rooms. I was in heaven. I was the first person to arrive one day, equipped with a camera, plenty of film, a tape measure, my sketch pad and plenty of sharpened pencils. All day I studied the cellars, essentially drawing and photographing with precision every room that moved me. I didn’t know why I did it. I doubt he understood me; and of course I had no intention of doing such a thing at the time. I only knew that I wanted to and I never forgot that man or the motive he gave me to eventually embark upon this project. I’ve always thought of going back and showing him what I had accomplished, but I’m sure he is long gone. Now, I had only built a dog house, a chicken coup and a rabbit hutch in my life; so I needed an accomplished builder who understood what I wanted and could implement my dream. I not only found one, I found two of them. I was on my motorcycle, doing what I did virtually every day I was in Italy, searching for castles, monasteries and palaces to study, measure and photograph. (If someone accompanied me, they never came twice!) I’d start each day before dawn and travel road after road until I found something of interest, usually returning after dark. Her accent told me she was not Italian. She explained that she and her husband had first emigrated from Denmark to the U.S., then moved to Italy to realize their dream of a small winery and olive orchard. During our conversation, though, three salient points were made: her husband was a naval architect, he had built their two houses (which I could see were new but appeared centuries-old) and, as importantly, he’d always talked about returning to the U.S.
“But you haven’t even consulted your wife,” I said. And he loudly and sternly responded, “I said I will come!” I was too taken aback to probe further. A lot of people talk and do very little. I was not at all convinced that he meant what he said; and, although we spoke several more times over the next few weeks, I had my doubts about him showing up. Unbelievably, on the appointed date, Lars Nimskov arrived at my home in Calistoga; and we set to working on plans immediately. To really pull this project off, we needed more help. Luxury Tuscan-style homes are currently the rage in California and I have seen countless attempts to reproduce them authentically; but most have failed to a lesser or greater degree. You either understand how to build them, using old, handmade materials and ancient techniques, or you don’t, in which case they look fake. Either people don’t want to spend the money, the architects and builders don’t have the skills or they use modern techniques and materials to attempt a medieval look. I vowed to build a castle as I made my wines, without compromise. It would be done as realistically as possible; but to do it right we needed someone who actually had a lot of experience with medieval construction. Fritz Gruber, a master builder from Austria, had, like me, grown in love with medieval architecture and spent countless hours studying how to do it. He built small wine cellars for friends, using old world materials and techniques. He then decided to expand his business. He said I was as crazy as he was and we instantly took a liking to each other. He showed me underneath his house where he had built a labyrinth of medieval vaulted cellars. I loved them. I stayed at his house and we talked for three days. He agreed to come with six of his Austrian masons and stay for three months building the first two rooms, so our crew could learn from them. “But you are absolutely crazy!” He declared as I finally left. I was naive enough to think I was ready to begin. My plan was to incorporate all the ideas and details that I had assembled from my first trip to Italy in 1965 in my 8,500 square-foot winery. I would create a fantasy, a maze where every room and space opened into a new and different adventure as one traveled throughout the building. I would include all the elements of a true medieval castle- a moat and drawbridge, high walls and towers on a hillside, a great hall, courtyards and loggias, an apartment for the nobles, a big kitchen, an outdoor brick oven for baking bread, a church, a horse stables, secret passage ways and, of course, a prison and torture chamber. I was determined to erect the most beautiful and interesting building in North America for showcasing great wines; for it must not be forgotten that, aside from being defensive fortifications , throughout history and in modern times, many of the great wines in Europe have and are being made in castles.